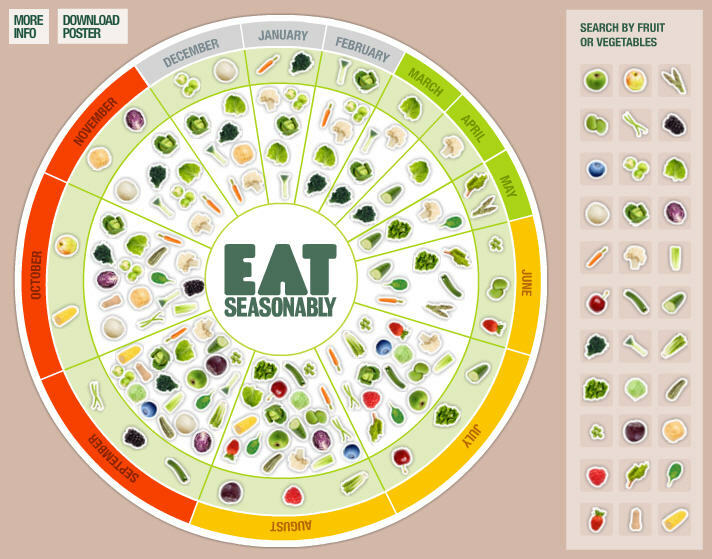 seasonal eating | To Health With That! Seasonal eating is something I feel passionately about – but seasonal eating for winter can be harder than in other seasons because it’s, well, winter. So here are some easy ways to incorporate some seasonal into your diet and to help your body manage the season in the best ways possible. It’s easy to dismiss this as a hippy/trendy kind of idea that has no real merit, but seasonal eating is the cornerstone of many ancient and holistic medical traditions. Of course there are the side benefits of getting to buy from local farmers and not having to let your food wilt during cross-country (or cross-globe shipping) but the big thing really is health. In the winter this is especially important because your body’s needs change with the more extreme outdoor climate (yes, even in Texas). Your body uses more energy for basics like warmth and you may find yourself needing more sleep in the colder, darker winter months. So here are some seasonal Eating tips that optimize winter veggies and your winter health. Squash is just about the quintessential winter vegetable and comes in many tantalizing varieties including acorn, winter, delicata, pumpkin, butternut, hubbard, spaghetti, kabocha, and crook-neck. With names like that it’s hard not to be intrigued. All of these squash have yellow to orange flesh, which is saturated with healthy carotenoids – which are compounds in the vitamin A family. All of the orange/yellow veggies have these carotenoid nutrients by color – it’s literally the colored pigments that supply the nutrition. These carotenoids, some of which convert to vitamin A, help boost your immunity against winter colds and flus, help to protect your dark vision (this is the dark season, after all) and are also high in potassium, vitamin B6 and folate. Additionally one serving of squash gives you half of your RDA of vitamin C, which also helps keep you protected from colds and flus. Nutritionally they provide lots of complex carbohydrates but very low sugars, which helps your body have the sustained energy it needs to help keep you warm and cozy. Squash are also very filling because of the complex carbs, giving you the delightfully full-belly feeling that we all crave in the winter. Squash and pumpkin seeds are also a great nutritional input in the winter and any squash seeds can be roasted and salted for a lovely crunchy snack. These seeds are high in good fats, protein and minerals and also add a tremendous boost to your immune system for this vulnerable time of year. Seasonal eating for winter isn’t so hard, right? Scoop the seeds out of the squash and remove most of the pulp. Bake at 350 for 10-15 minutes or until the seeds start to turn golden-brown. Watch them carefully because once they start to brown they really brown in a hurry. The little bit of squash pulp and juice that is left on the seeds adds a nice flavor with the olive oil and salt, but be careful. These are totally addictive so if you’re planning on using them as a salad-topper or anything like that be sure to hide them from the family. Otherwise they’ll be gone in a flash. In winter the cold-weather greens abound. Think cabbage and kale and Brussels sprouts. The cold weather keeps these greens sweet and tender and the greens help you to stay healthy and illness-free in the winter. These are nutritional powerhouses which are high in vitamins A, C, K and folate. Also they have a good balance between complex carbs, fiber, protein and good fats. Also, Brussels sprouts cut in half and fried with bacon pieces is a treat beyond compare – seriously even non-veggie people love this. ‘Tis the season for all the underground veggie goodness to get underway. 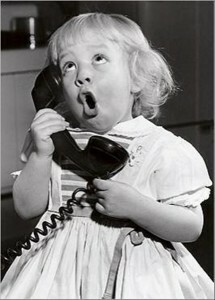 Think beets, carrots, parsnips, turnips and sweet potatoes. A cubed root-veggie mix is perfect to drizzle with olive oil and roast in the oven at 425 or so for a warming, nutrient-dense winter treat. Roasted root veggies literally make you feel warm when you eat them and are also packed with the nutrients your body needs for the winter months. Again these veggies are packed with vitamin A and other antioxidants, as well as the complex carbs needed to sustain warmth in the winter. Also high in fiber and highly filling. Slow Cooked Soups and Stews – The Easiest Seasonal Eating for Winter Ever. Of course the perfect food in the winter is slow-cooked. Pot roast with root veggies, slow-cooked stew, veggie-rich chili, or homemade chicken soup. These are the foods that warm and nourish you. The slow-cooking does all of the heavy digestive work for you and these foods are mostly broken-down and actually make you feel warm inside. In Traditional Chinese Medicine slow cooked foods are appropriate for winter when your body needs heat and easy nourishment and when warmth is a priority. 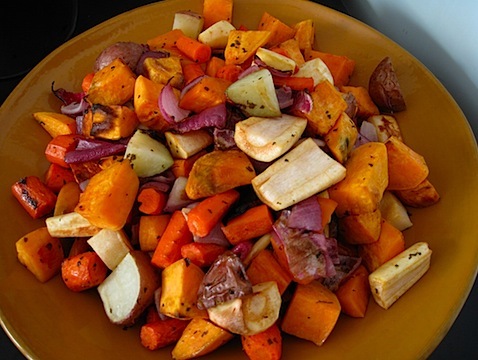 Also the slow cooking releases all of the nutrients from root veggies and softens them up so a lovely roast surrounded by root veggies is the quintessential winter dish. Seasonal eating for winter makes sense on this level – you’re semi-hibernating and need easy nutrition that keeps you warm and cozy and is the food equivalent of fuzzy socks and a fireplace. The fall-apart in your mouth meat of a pot-roast is just what you need to warm up. Also as long as you’re using grass fed, grass finished beef you’re getting a good dose of omega-3 fats, iron to build your blood and easy to digest protein. 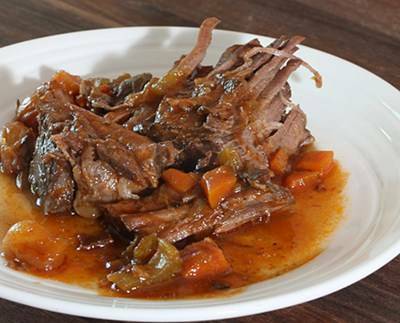 pot roast is the perfect food for seasonal eating for winter. It’s exactly what you want on a cold day. Thanks to colonywinemarket.com for this yummy picture. Seasonal eating for winter sounds like it should be difficult, but just follow your gut. The squash heaped in gorgeous piles around the farmers market are begging to be eaten. All of those crisp winter greens are packed with nutrients and the colorful root veggies tempt your senses. Best of all, the slow-cooked soups and stews that feel so good on a cold day are exactly what your body wants for health. 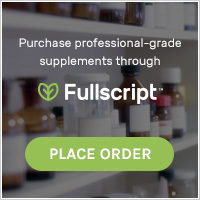 This entry was posted in Food Source, Natural Cycles, Nutrition and tagged nutrient density, nutrients by color, nutritarian, seasonal eating, seasonal eating for winter, seasonal food, slow cooking on January 13, 2015 by amyneuzil.